Abstract Circular RNAs（circRNAs）inanamals are an enigmatic class of RNA with unknown function. To explorecircRNAs systematically, we sequenced and computationally analysed human, mouseand nematode RNA. We detected thousands of well-expressed, stable circRNAs,often showing tissue/developmental-stage-specific expression. Sequence analysisindicate important regulatory functions for circRNAs. We found that a humancircRNA, antisense to the cerebellar degeneration-related protein 1 transcript(CDR1as), is densely bound by microRNA(miRNA) effector complexes and harbours63 conserved binding sites for the ancient miRNA miR-7. Further analysesindicated that CDR1as functions to bind miR-7 in neuronal tissues. 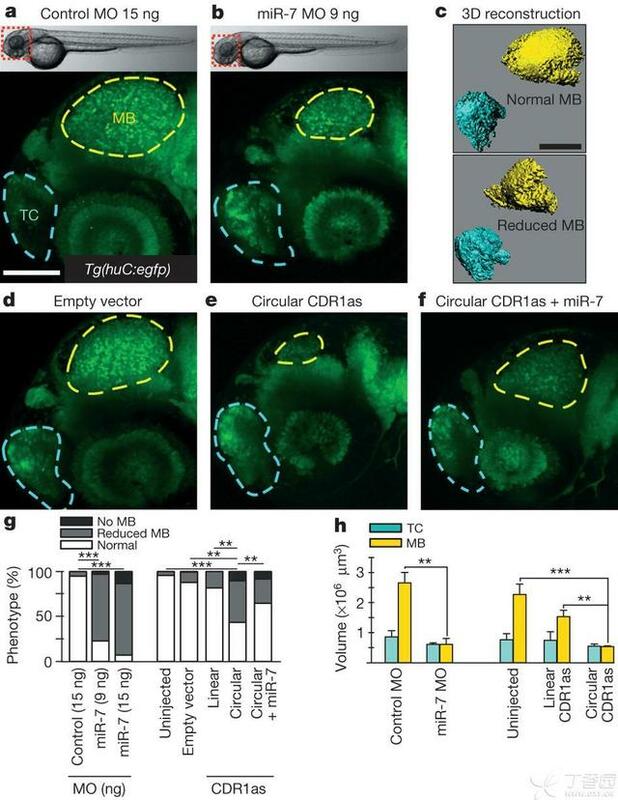 Human CDR1asexpression in zebrafish impaired midbrain development, similar to knocking downmiR-7, suggesting that CDR1as is a miRNA antagonist with a miRNA-binding capacityten times higher than any other known transcript. Together, our data provideevidence that circRNAs form a large class of post-transcriptional regulators.Numerous circRNAs form by head-to-tail splicing of exons, suggesting previouslyunrecognized regulatory potential of coding sequences. Figure1 Detection, classification andevolutionary conservation of circRNAs. a，Thetermini of junction-spanning reads (anchors) align sequentially to the genomefor linear (top) but in reversed orientation for head-to-tail spliced reads(bottom). Spliced reads must distribute completely to anchors, flanked by AG/GU(Methods). b, c,circRNAs in human cell types (b) and nematode stages (c). d, Genomic origin of human circRNAs.A total of 96% of circRNAs overlap known transcripts. e, Examples of human circRNAs. The AFF1 intronis spliced out (Supplementary Fig. 2e). Sequence conservation: placentalmammals phyloP score (Methods), scale bar, 200 nucleotides. 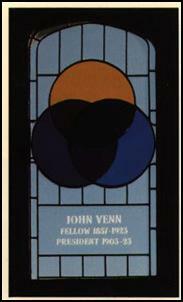 Supplementary Fig. 1j, k). Third codon positions aresignificantly more conserved (P,4310210,Mann–Whitney U-test, n5223). Figure 2 | CircRNAs are stable transcripts with robustexpression. 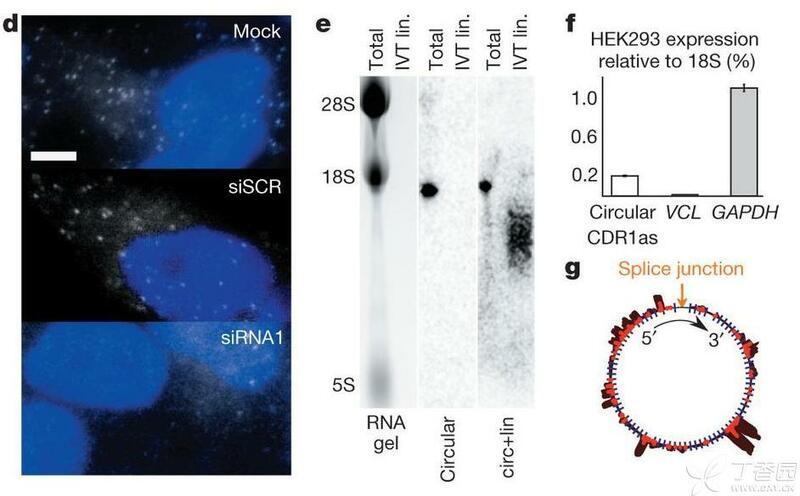 a, Human(hsa) ZRANB1 circRNA exemplifies the validationstrategy. Convergent (divergent) primers detect total (circular) RNAs. Sanger sequencing confirms head-to-tail splicing. b, Divergent primers amplify circRNAs in cDNA but not genomic DNA(gDNA). GAPDH, linear control, size marker in base pairs. c, Northern blots of mock (2) and RNase R (1) treated HEK293 total RNA with head-to-tial specific probes for circRNAs. 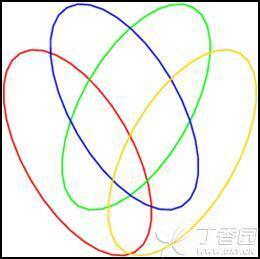 GAPDH, linear control. d,e, circRNAs are at least 10-fold more RNase R resistant than GAPDH mRNA (d) and stable after 24 h transcription block (e) (qCPR; error bars indicate standard deviation). Figure 3 | The circRNA CDR1as is bound by the miRNAeffector protein AGO, and is cytoplasmic. a, CDR1as is densely bound by AGO (red) but not by unrelatedproteins (black). Blue boxes indicate miR-7 seed matches. nt, nucleotides. 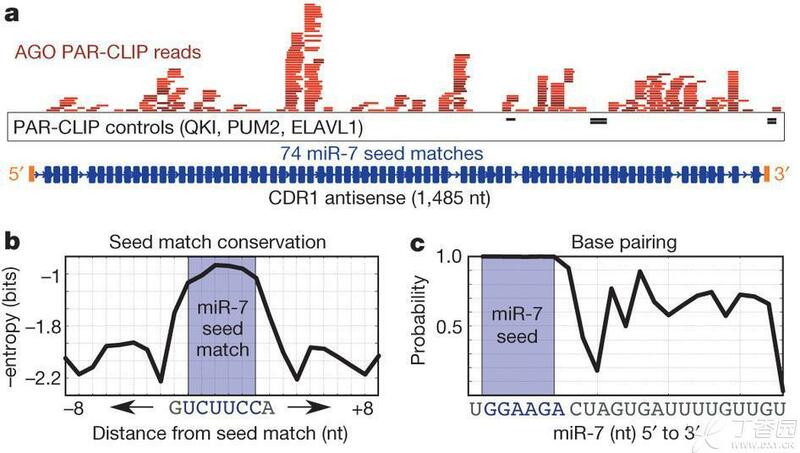 b, c, miR-7 sites display reducednucleotide variability across 32 vertebrate genomes (b) and high base-pairing probability within seed matches (c). d, CDR1as RNA is cytoplasmic and disperse (whitespots; singlemolecule RNA FISH; maximum intensity merges of Z-stacks). siSCR, positive; siRNA1, negative control. Blue,nuclei (DAPI); scale bar, 5 mm (see also Supplementary Fig. 10for uncropped images). e, Northern blotting detects circularbut not linear CDR1as in HEK293 RNA. Total, HEK293 RNA; circular, head-to-tail probe; circ1lin, probe within splice sites; IVTlin., in vitro transcribed, linear CDR1as RNA. f, Circular CDR1as is highly expressed (qPCR, error bars indicate standard deviation). g, CDR1as. 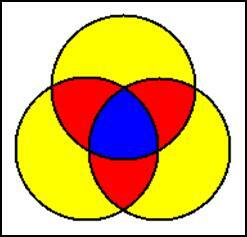 Blue, seed matches; darderd, AGO PAR-CLIP reads; bright red, cross linked nucleotide conversions. 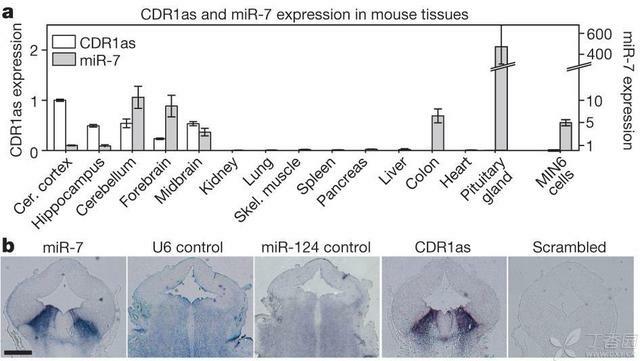 Figure 4 | CDR1as and miR-7 have overlapping and specificexpression in neuronal tissues. a,Among mouse tissues and MIN6 cells (qPCR, relative to cerebral cortexexpression; error bars indicate standard deviations; see Supplementary Fig. 9afor miR-122 control) neuronal tissues co-express miR-7 and CDR1as. b, Insitu staining of CDR1asand miR-7 in mouse embryo brain E13.5 (U6 and miR-124, positive control;scrambled probe, negative control). Scale bar, 1mm. dashed line, midbrain (MB)). Embryos after injection of 9 ngmiR-7 morpholino (MO) (b) display a reduction in midbrainsize. Panel a shows a representative embryoinjected with 15 ng control morpholino. 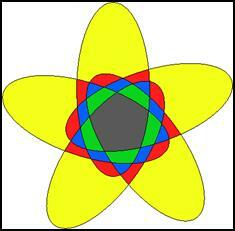 c,Threedimensional volumetric reconstructions. d,Emptyvector control. e, Expression vector encoding human circular CDR1as. f, Rescue experiment with miR-7 precursor. g, Phenotype penetrance (% of embryos, miR-7 MO, n=135; uninjected, n=83; empty vector, n=91; linear CDR1as, n=258; circular CDR1as, n=153; circular CDR1as plus miR-7 precursor, n=217). phenotype distribution derived from at least three indepenent experiments. Scale bar, 0.1mm. ** P<0.01; ***P<0.001 in Student t-test for normal midbrain, reduced midbrain (see also Supplementary Fig.6). 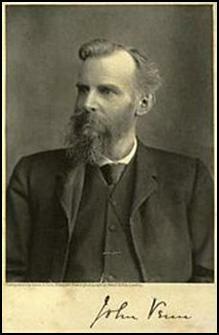 h, Phenotype quantification (Methods). Error bars indicate standard deviation n=3 per group. Abstract Theversatility of RNA seems limitless. The latest surprise comes from circularRNAs, which are found to counteract the function of another class of regulatoryRNA –the microRNAs. Figure 1 | Constraints on evolutionary change in microRNAs. 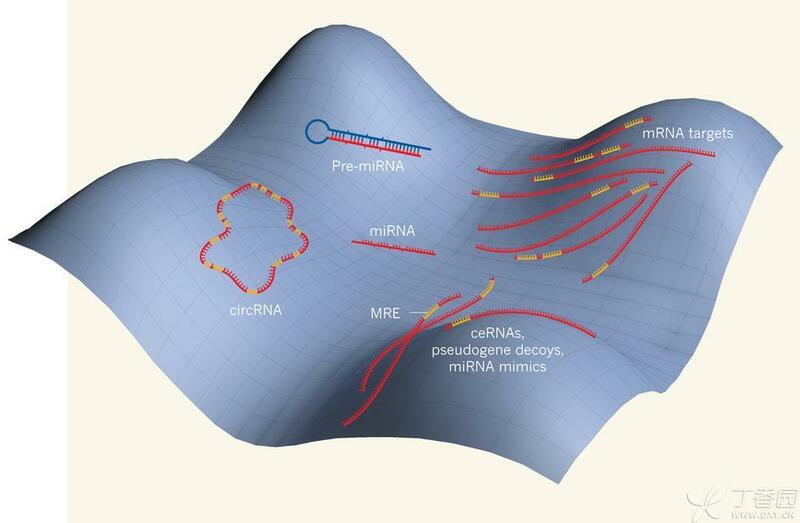 MicroRNAs (miRNAs) liein a fitness valley constrained by their numerous interactions, which includethose with the hairpin structure of the precursor miRNA (pre-miRNA), the many targetmRNAs and other RNAs that terminate or modulate miRNA binding to targetsequences by competing against them. The latter category includes competingendogenous RNAs (ceRNAs), pseudogene decoys and miRNA mimics. Two studies1,2 introduce circular RNAs(circRNAs) as another constraining factor. MRE, miRNA-response element. It seems to me that you'll very likely to be a distinguished scientist in the future. Come on!